In March, Atari Corp. made a significant showing at Cebit, the largest European computer trade show, held annually in Hannover, West Germany. On display were the new Atari Transputer Workstation (ATW); Atari 68030 machine (TT); a new hard-disk drive with removable disks; ST Laptop (Stacy); hand-held MS-DOS computer; and several other products that have yet to be shown in the United States. On return to its home in Sunnyvale, California, Atari Corp. stopped in Chicago to display some of its wares at the Spring COMDEX computer trade show. COMDEX—the Computer Dealers Exposition—has in recent years drawn ever fewer actual dealers. Instead, the press, the distributors and the curious come to view what's new and what might become a future market leader. Atari sees COMDEX as an important public-relations tool and, to a lesser extent, a good place to poll its audience. The Atari booth, prominently positioned at the entrance to one of the main halls, was filled with the usual Atari Corp. personalities: Sam Tramiel, president; Sig Hartmann, corporate marketing; and Mel Stevens, trade show promotion director. The turnover of Atari employees has been just as fierce as previous trade shows. New on the scene is the executive trio of Atari Computers USA: Mike Dendo, V.P. sales; Joe Mendolia, V.P. marketing; and Tony Solarno, software marketing. COMDEX is promoted as a business trade show, so the usual bag of Atari products surprisingly did not include MIDI or entertainment products. Atari's image as a game-machine company does not have to be promoted at COMDEX. However, its lead in the MIDI market is vulnerable to attack from PCs, the Macintosh and the Amiga. Among the various conferences during the show, Atari was not present at the MIDI conference, while several Amiga enthusiasts did attend, promoting the Amiga as the better MIDI machine. Atari is aiming its higher-end ST machines at the desktop-publishing (DTP) market; yet, the Atari booth did little to promote the DTP solution it so zealously wants to pitch. Previous Atari trade-show exhibits have been effective in comparing the operating speeds of the Macintosh, Amiga and ST. Desktop publishing products on the level of Calamus, Page-Stream and Desk Set II fare very well in head-to-head challenge with PageStream PC or Illustrator Mac. Atari's promotional failings are overshadowed by the new hardware the company will soon begin shipping to U.S. dealers. The commitment to new products seems never-ending, with new technology and improvements to existing platforms at the center of Atari's product-development efforts. Atari exhibited four new hardware products and two new software products, with promises of quick releases to dealers. Perhaps the most exciting news from Atari is the introduction of Stacy, a laptop version of the 1040ST computer. 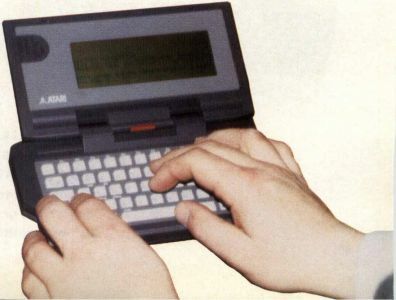 Weighing in at under 15 pounds, including batteries, Stacy costs under $1,500 and comes with one megabyte of memory, an LCD Supertwist display, an exceptionally nice keyboard and one floppy-disk drive. Atari expects a number of Stacy accessories to be available late this year. In the works are additional floppy-disk drives, an internal 40-megabyte hard-disk drive and two-/four-megabyte memory upgrade kits. Extended memory upgrades are important to MIDI users. Although Atari expects MIDI revenue to account for the bulk of Stacy's sales, Wayne Smith, Southern California sales manager for Atari, foresees the Stacy being sold to government and municipal accounts. "Zenith is the only laptop company that has gone after police departments," Smith said. Smith sees the Los Angeles Police Department using Stacy to take police reports. Insurance companies, another type of organization that works outside the office, will also be a candidate for Atari's new laptop. Macintosh users have also begun looking at Stacy. With the Spectre 128 cartridge, Stacy becomes an inexpensive Macintosh portable. Apple's plans for a Mac laptop seem to be stalled for the moment, providing Stacy with a boon of publicity. A firm release date for Stacy was not available by press time; however, Tramiel promised the first shipments to begin in June/July 1989. Tramiel further pledged the first production runs of Stacy to the U.S. market. 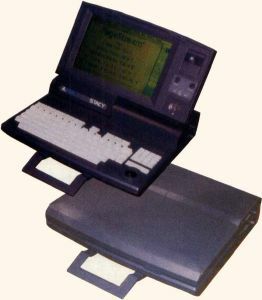 The Stacy is the portable equivalent of a 1040ST computer with monochrome monitor. Since the TOS operating system has not changed, Stacy should be able to run all existing ST software and utilities. Minor problems might be encountered with the screen display, which is driven by a new custom chip called Shadow. The LCD screen operates fairly quickly, with a very subtle lag noticeable when the cursor is moved around the display. The screen may be tilted to several positions. Built into the keyboard is a small trackball—an upside-down version of a mouse. Rolling the trackball affects the screen position of the cursor, just as a normal mouse would. Directly above the trackball are left and right mouse-button equivalents. GEM operations that expect a mouse button to be held down while the mouse is moved are difficult with the Stacy trackball. Stacy also has the two standard joystick/mouse connects, so a regular Atari mouse may be used. 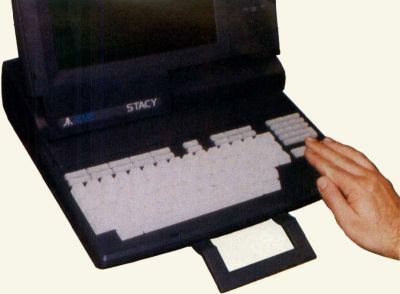 Stacy's keyboard is the laptop's most impressive feature—a complete departure from Atari's existing line of computers. Each key has a complete mechanism, making fast touch-typing possible for the first time on Atari equipment. Secretaries accustomed to an IBM Selectric typewriter will be happy to use Stacy. To the right of the LCD display are volume control knobs for the built-in speaker and a contrast knob that changes the display's angle of visibility. Above the knobs is a paper-holder clip that doubles as a trackball holder when the case is closed. Several bus expansion plugs have been designed into Stacy, and removable plastic doors protect the machine from the elements. The rear panel protects the connector plugs for printers, modems, external hard disks, external floppy disks and RGB or monochrome monitor hookup. The rear panel doubles as a rear stand, positioning Stacy toward the user. 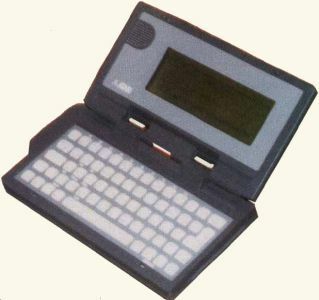 Amid rumors that an Atari pocket computer was being developed, Tramiel officially introduced the Portfolio hand-held MS-DOS computer at COMDEX. Portfolio is not the first MS-DOS hand-held, but Atari might certainly have the least expensive system: Portfolio carries a low $399.95 list price. Inside its clamshell-style enclosure, Portfolio sports a four-line, 40-character LCD display. The text is large enough for most users; however, the display is big enough for simple tasks but not enough for most MS-DOS applications. A small audio speaker produces key clicks to the left of the screen. The speaker can also be used to vocalize phone company touch-tone sounds as part of a phone-directory application that comes with the operating-system software. The keyboard follows the QWERTY layout, but is much too small for touch typing. The key tops most resemble Hewlett Packard's scientific calculator keys, with foam pads being used for each key mechanism. Considering its size and weight, the keyboard is better than one might expect. A slot on the lower left side allows data cards to be added to Portfolio. The cards add extra memory, programs and non-volatile memory to the system. Memory cards have an additional expansion bus so other cards can be "piggy-backed." Built into the Portfolio ROM operating system are several applications: personal diary, phone book, worksheet and text editor. The programs are multilingual, with an easy software switch from English to French to German. Other applications can be loaded into Portfolio, but only through a communications data card, which won't be available with the release of the computer. Three AA batteries power the Portfolio for approximately six hours of use. Designed by DIP, Ltd., of England, the software has an English tone, with English pound signs often found where American's might expect "$" characters. Although Tramiel has promised a quick release to U.S. dealers, there are many parts missing from the complete Portfolio system. A ten-minute video presentation prepared by DIP, Ltd., shows the Portfolio used by salesmen taking spreadsheet figures to a jobsite away from his/her office. Data from Lotus 123 on an IBM PC is downloaded into a data card, which is then plugged into the Portfolio. Data is transferred to the data card through a device that looks like a half-height floppy-disk drive that can read and write to a data card. Atari did not know if the datacard transfer box would ever be available for the Portfolio. Atari also lacked a clear understanding of the expansion cartridges. Attaching a serial or parallel printer, modem or other external device requires a data cartridge. Atari has in the past been equally vague about products that were given a minimal marketing effort. For two years, Atari has displayed prototypes of its CD-ROM device. 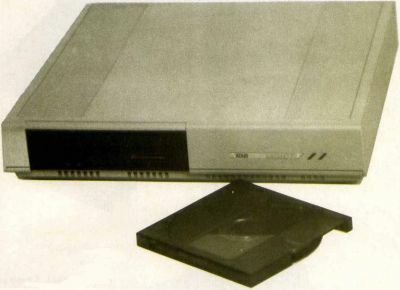 More than 300 megabytes of data can be stored on a compact disc (CD); the CD-ROM unit allows an ST computer access to the CD data. "The CD-ROM is now shipping in West Germany," said Joe Mendolia, V.P. marketing U.S., "But I am not certain if it will make it into American distribution. Our plate is very full right now." Mendolia expects his view to change once plans for existing product introductions are complete. Currently on Atari's plate is a new hard disk drive that features a removable platter. Manufactured by Syquest, the removable disk drive has been put into a Mega ST-type box. Platters are removed through the front of the cabinet, just like floppies. Each platter stores 44 megabytes of data, with an average access time of only 25 milliseconds. The device plugs into the DMA port. DMA Out is included, so the removable may be daisy-chained with other devices (e.g., laser printer, tape streamer, hard disk drive, etc.). The platters will have a list price of $150, with the drive unit costing $1,199. Mendolia expects dealer shipments to begin in August 1989. Atari's latest attempt at the MS-DOS personal-computer market, the Atari PC4, was unveiled at COMDEX. Atari introduced its PC1, a low-end IBM PC XT clone at the 1987 Fall COMDEX trade show, as reported in ST-LOG. Atari's hopes were to compete with the low-end IBM PC-XT-clone manufacturers, and as an afterthought, they expected PC dealers to pick up the ST line. Since then, Atari has shown the PC2 (with IBM-style expansion slots) and the PC3 (offering the more advanced 80286 central processing unit compatibility). The PC4 offers a 1.2-megabyte 5¼-inch floppy drive and a 60-megabyte hard disk. The system is equipped with one megabyte of RAM, with expansion slots up to eight megabytes. Video output is user-selectable for monochrome, Hercules or color displays. The system is equipped with CGA, EGA and VGA output; VGA is currently the most sophisticated video display adapter available to IBM PC users. The PC4 has a suggested retail price of $1,995, which is competitive with other clone manufacturers, though not a bargain. Atari sees the PC4 sold to small-business and vertical-market system users looking for an IBM PC-AT clone. Previous Atari PC machines came with bundled software from Digital Research, the makers of the GEM operating system; however, the PC4 is bundled with Microsoft Windows, a competing visually driven operating system to GEM. Also included with the Windows operating system is MS-DOS Version 3.3, GW-BASIC Version 3.2, Windows Paint (a drawing program similar to Macpaint for the Macintosh) and Windows Write (modeled after Microsoft Word). A major drawback of the PC4's predecessors has been resolved with the inclusion of one PC/XT-compatible expansion slot and five PC/AT slots. Obtaining the true power of a PC requires plugging in expansion boards that add more memory, ports and other accessories. Previous Atari PC machines have lacked this ability. The PC4 also comes with a standard serial, parallel and mouse I/O port, as well as a socket for an 80287 math coprocessor. While the Atari PC has sold fairly well in West Germany, it has fallen on its face in England, Canada and France and was never released in the U.S. market. Atari's price point, lack of local service centers and product specification deficiencies have kept the Atari PC out of the U.S. market. Nowhere to be seen on the COMDEX floor was the rumored Atari 68030 ST computer, commonly known as the Atari TT. As the Atari ST celebrates its fourth birthday, you might expect Lorne Greene to say, "That's one hundred human years in the lifetime of a computer." Atari enthusiasts eagerly anticipated the public display of the next generation of Atari computers. Fearing a backlash of negative publicity due to the company's previous announced-but-never-shipped products, the TT was not shown. 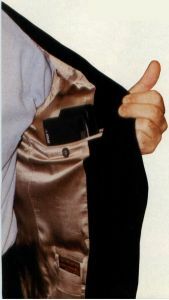 "The TT is in the prototype stage," Tramiel told a group of Atari software developers attending a cocktail party after the show. Two hundred and fifty TT units are under construction in Atari's Taiwan plant, to be distributed to developers over the next few months. Tramiel told developers the TT will come with TOS 1.4, making it compatible with existing ST software. 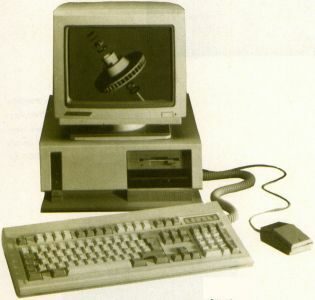 Atari has tested DynaCADD, the powerful Computer Aided Design (CAD) system from ISD Marketing, with the prototype TT computer. The TT will also come with the UNIX 5.3 operating system, popular with educational and scientific institutions. In the upcoming battle between microcomputers and workstations, Atari could become a winner by offering GEM, UNIX, Macintosh (using Spectre 128) and MS-DOS (using PC-DITTO II) compatibility. Atari created a new position, director of software marketing, 22 days prior to COMDEX. 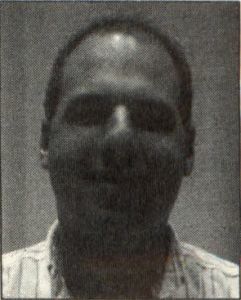 Antonio Salerno is responsible for bringing new Atari software products to market: desktop publishing, word processing, PostScript emulation and several utility programs. Desk Set 2 is a sophisticated desktop-publishing system from G.O. Graphics. 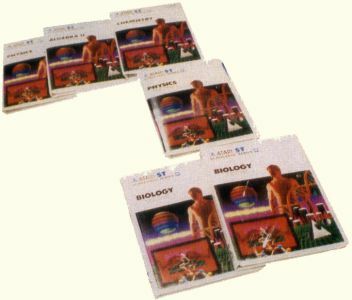 Atari announced Desk Set 2 at last year's COMDEX in Las Vegas and promised shipment by July 1989. At $299, Desk Set 2 is not for every ST user: It requires a Mega ST4 and SLM804 laser printer. G.O. Graphics has licensed a large library of fonts from Compugraphic, the world's leading manufacturer of typesetting equipment. The fonts are created by describing the outline of each character. When a large 48-point font is needed, the font description is enlarged mathematically to create the necessary screen or printer font. The results are smooth curves and slick strokes. The overwhelmingly negative feature of Desk Set 2 is the program's slow screen redrawing speed. When changes are made to an area of text, the program redraws the entire page, including those objects that are not visible within the GEM window displaying the document. Once the drawing is complete, the user may speedily scroll around the document. Most desktop-publishing programs redraw only the portion of the document that fits in the GEM window. To the experienced end-user, the Desk Set method of redrawing the screen will appear too slow to be practical. 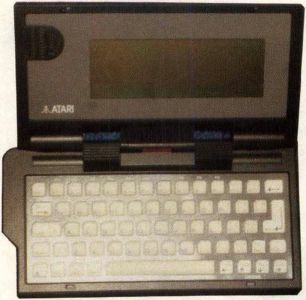 As a replacement for the failed Microsoft Write word processor, Atari unveiled Word Flair ($149 List), a word processor with graphics ability and a built-in database. "Word Flair is a compound document processor," said Lauren Flanegan-Sellers, chairman of Blue Chip Software, the software development firm that created the new Atari-licensed product. Word Flair works much like a desktop-publishing system: Objects and text areas are defined, then the actual text of a document is added later. 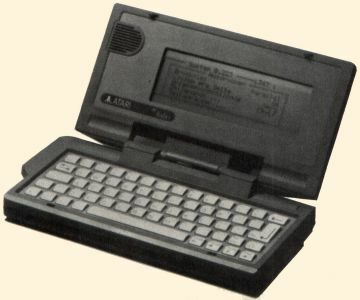 Flanegan-Sellers approached Atari Corp. in 1987 to produce an object-oriented word processor that incorporated the functions demanded by small-businesspeople in Blue Chip's computer training courses. Three years and 250,000 lines of Mark Williams C code later, Word Flair is poised to be a significant contender in the ST word-processing market. Word Flair is a GDOS application, making it immediately compatible with the large library of fonts available from Atari, as well as the printer drivers available from companies such as MichTron and Neocept. GDOS is Atari's enhancement to the GEM operating system that allows programs to display various fonts and graphics on the ST screen and then print the results to several dot-matrix printers or the Atari SLM804 laser printer. The added graphics ability usually retards ST programs—not true in Word Flair's case. The program speeds along, displaying stylized fonts and graphics while keeping up with the end-user. Scanned images and clip-art may be pasted into a Word Flair document. The program recognizes the .IMG graphic file format, used by most image scanners and PC-based graphics programs. Word Flair may use the clip-art images sold by Migraph, a leading ST graphics firm, and a conversion utility is available for DEGAS Elite files. Images may be scaled up or down and moved anywhere within the document. Cropping an image is unavailable. The program functions as a desktop-publishing system: A palette of objects is used to create regions of text and graphics within the open document. Any number of columns of text may be established with the quick click of a mouse button. Text may either be imported from an ASCII disk file or typed directly into the document. Macintosh-style text selection using the mouse is supported with Cut, Copy and Paste appearing as standard drop-down menu functions. Word Flair displays a document in two views: Actual and Whole Page. Actual shows a close-up view of the text, making detailed editing easy. Whole Page shows the layout of the entire page, allowing quick changes to large portions of the document. Text is entered and edited directly on the document window, unlike Desk Set 2, which requires the use of a dialog box. The program's text layout does not support leading (varying the space between lines) and kearning (varying the space between letters). A database program is built in, allowing mailing lists and other data to be stored and summarized. Data can be used as part of a Word Flair document, and financial calculations and bar graphs are easily created with the built-in database commands. Within five minutes, Flannegan-Sellers created and printed a form letter that graphically showed the sales performance of several real estate contractors. Help screens are context-sensitive, and every dialog box includes a help button. Help screens appear in a GEM window next to the Word Flair document, so the help information can be used while working on a document. At first glance, Word Flair is a winner. The few flaws all have to do with GDOS. Word Flair relies on GDOS to print a document, and GDOS treats all documents as graphic images. Most business-people do not have the five to seven minutes required to print a GDOS document on a dot-matrix printer. With the Atari laser printer, this time lag is reduced to less than 30 seconds; however, the laser printer is an expensive accessory for most ST owners. Microsoft Write overcame this problem by offering a "print text only" option, which Word Flair does not offer. For years, Atari has promised a local-area network (LAN) for the ST. LANs allow many computers to share disk drives, printers and other devices. To the end-user, files stored on one ST's hard disk will appear on the GEM desktop as though the hard disk was connected to the local ST. Lack of an ST LAN has hindered the ST in the American small-business market. "Our approach was to make a LAN compatible with all computers," said Tan Sickmann, lead programmer for BioNet GMBH, based in Burbach, West Germany. Sickmann demonstrated BioNet 100, an Ethernet LAN for the ST and MS-DOS computers. Ethernet is a popular LAN that works well for high-speed data transmission: Sickmann's demonstration made it appear that the hard disk was on the local ST, when it was really attached to another system. Although the $800 price tag is too high for most American ST users, BioNet is expensive when compared to equivalent PC-based LAN systems. The cost is based on hardware and software development expenses. Special patch software is placed in an ST computer's AUTO folder, making BioNet compatible with the most primitive levels of the ST operating system, and a small box providing Ethernet coaxial cables connects the ST to the rest of the LAN. BioNet gives ST users access to the Digital Equipment Corporation DEC-NET international network, and corporations looking for inexpensive workstations can immediately connect the ST to the 800,000 DEC-NET nodes worldwide. An IBM PC/AT clone may also be connected as a file server using a BioNet 100 PC-card. "We have tested BioNet with all the released versions of TOS," Sickmann said, "including TOS 1.4 and Blitter TOS." BioNet software is very sophisticated. Problems with viruses have been solved by placing BioNet software below the TOS BIOS, the part of the operating system that a virus attacks. Built-in network safety systems include password protection, system administrator functions and intelligent file-locking mechanisms that also detect an ST crashing off the network. Atari announced a special package of desktop-publishing software and hardware, bringing the price tag of a complete system to under $4,000. The package includes a Mega ST4, a laser printer, a 30-megabyte hard disk, the Timeworks Publisher ST software and a library of 50 stylized fonts. Compared to separate purchases of all the items, the DTP package adds up to a $1,760 savings. Atari appears to have shelved GDOS for Ultrascript, a PostScript clone that works with the Atari laser printers. Atari now promotes the SLM804 laser printer as "PostScript compatible." PostScript is a page-layout language, made popular by Apple with the graphically oriented Macintosh laser printer. Previously, Atari evangelistically relied on GDOS to print graphic images and stylized fonts. UltraScript was written by Imagen, a subsidiary of QMS, which manufactures, among other things, PostScript laser printers. Atari's decision to bundle Timeworks Publisher ST aims the DTP package largely at the PC market. Timeworks Publisher ST is modeled after Xerox Ventura Publisher, the leading DTP package for MS-DOS computers. 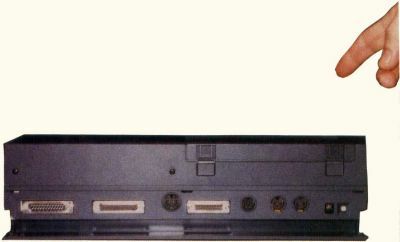 The other DTP systems for the ST are modeled after Macintosh DTP systems. "We're going after Pagemaker on the Mac," said Nathan Protechin, marketing director of ISD Marketing. ISD introduced Calamus Outline, a rendering program that offers many of the features of Freehand, a leading Macintosh program. Outline supports splines, curved lines that flow through a set of points defined by the artist. The baseline of text may curve to a defined spline. Other features include color layers, access to a large font library and pattern fills. Graphics development with Outline may be imported into Calamus, ISD's high-end DTP system. Protechin demonstrated a new version of Calamus that includes Microsoft Write and WordPerfect file import, text shadowing and a new outline font system. The new outline fonts allow Calamus users to individually specify the point size of any font. The program then mathematically calculates and draws the font to a display screen or printer. ISD licensed 84 fonts from FC Font Technologies, a division of Agfa/Compugraphic Corp., one of the largest U.S. manufacturers of typesetting equipment. Graphic artists will rejoice over the new fonts, which include the true versions of Garamond, Souvenir, Times, Avant Garde, Futura and Univers. Each typeface carries a $99.95 list price and works with Calamus and Calamus Outline. For designers of type styles, the new Calamus Font Editor ($99.95 List) allows artists to create their own outline fonts. The program uses Bezier Curves—a special spline—to define the shape of each letter. The Font Editor disk includes 24 additional fonts, which may easily be modified by an ST user. The program is fairly sophisticated, supporting free rotation, italics, mirror imaging and font condensing functions. ISD also expects to have a Calamus image scanner available later this year. The third method of getting professional graphics onto your ST screen was demonstrated in the latest version of PageStream, formerly Publishing Partner Professional. PageStream was developed to use a PostScript laser printer, then was later changed to support most of PostScript's command internally to the ST. The result is a sophisticated program that supports text rotation, kearning and leading. R/C Aerochopper ($199.95 List) is a sophisticated flight-simulation system that turns your ST computer into a remote-controlled glider, helicopter, jet fighter and trainer. The package includes the same transmitter box and controls as the Futaba Conquest series of remote controls used by the real hobbyist. Two joysticks control the power and direction of the remote-controlled aircraft. With the control in your hands, the simulation accurately displays the view of your aircraft, making maneuvers with adjustable wind conditions, adjustable control response and realistic sound effects. Playing with R/C Aerochopper is like eating peanuts: One game is not enough. The disk-storage features save the 131 user-selectable flight characteristics. To practice certain maneuvers or to make things more challenging, the program has various camera control modes, trim adjustment and even random control glitches. When your aircraft crashes into the ground, rather than losing a $1,000 remote-control glider, you can hit Undo and keep playing. Migraph introduced several new scanners for the ST. Scanners make it easy to incorporate photos, drawings, logos and clippings into computer documents, and scanned images can be loaded into desktop-publishing systems, such as the Supercharged edition of Migraph's Easy Draw. The new scanners include a handheld model, a full-page sheet-fed model and a flatbed model. The Hand Scanner, expected at under $400 list, scans images up to four inches wide and has different scanning resolutions between 100 and 400 dots per inch with adjustable contrast. A special GEM desk accessory edits the scanned image, saving images in a variety of file formats: .IMG, .PCX, .PIC, DEGAS Elite, MacPaint and PrintMaster. The sheet-fed and flatbed scanners operate at several resolutions up to 300 dots per inch. Scanned images are more accurate overall than the Hand Scanner. Prices are expected to run $1,000 for the sheet-fed scanner and $1,500 for the flatbed unit. In support of the scanners, Migraph has introduced Touch-Up ($179.95), a graphics application that works on bit-images not limited by screen size or resolution. Images that have been scanned almost always need corrections and touch-ups. The program combines a wide range of drawing tools with special effects, outline fonts and screen-editing functions. A special version of Touch-Up will be bundled with the Hand Scanner for only $400, and current Touch-Up owners will receive a special upgrade offer. "We've had a problem with users not understanding the difference between Touch-Up and Easy Draw," said Liz Mitchell, V.P. operations for Migraph. Touch-Up was designed to create and edit bit-images that may be incorporated into a desktop-publishing program, such as Supercharged Easy Draw, Calamus, PageStream and others. Bouncing back from the troubles experienced with GFA Systemtechnik, the West German company that created GFA BASIC, MichTron introduced a new line of programming tools and utilities for the ST. HiSoft BASIC is MichTron's replacement for GFA BASIC 3.0. HiSoft BASIC is modeled after Microsoft Quick BASIC for the IBM-PC and Macintosh. Supporting HiSoft BASIC are Devpac ST (68000 Macro Assembler), WERCS (Resource Construction Set) and SAVED (Utilities Desk Accessory). The programs work together to provide a complete programming environment. HiSoft BASIC is also available for the Amiga; however, no plans have been made for MS-DOS or Macintosh compatibility. MichTron continues to sell the GFA BASIC Training Reboot Camp and the GFA BASIC Programmers Reference Guide, though they no longer market GFA BASIC. Fast FAX is MichTron's announced facsimile-transmission system for the ST. Packaged in a silver external equipment box, Fast FAX connects to the ST's serial port and acts either as a 9600-baud FAX modem or a 2400-baud Hayes-compatible modem. Expect a $700 to $800 list price when the product begins shipping late this year. MichTron introduced TailSpin ($49.95 List), an icon-driven adventure creator. Functioning much like Hypercard for the Macintosh, live areas of an ST screen are delimited that cause actions and special effects. Color art images and sound effects may be incorporated into finished programs. A public-domain run-time module is included, making it possible to publish your own TailSpin programs. STACY Atari Computer's laptop PC, the Stacy, sells for less than $1,500 and includes a full megabyte of RAM, 8MHz system speed, LCD display and all of the processing capabilities of the company's ST line. Fleet Street Publisher 2 ($149.95 List) was demonstrated by George Miller, MichTron’s new director of Technical Support. Fleet Street 2 offers true what-you-see-is-what-you-get displays on monochrome monitors (72 dots per inch.) The new version supports PostScript output files, multiple pages and a font library, and works with the stock 520ST color or monochrome computers. Atari Computer has combined the portability of a floppy drive with the capacities and access times of a hard drive in the Megafile 44 hard drive with removable cartridge. The system provides ST users with virtually unlimited hard-disk storage in a single drive. 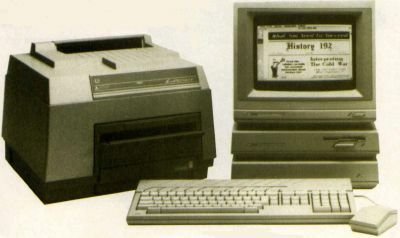 Atari Computer offers a complete DTP system, including the powerful Atari MEGA 4 personal computer, the PostScript-compatible SLM804-PCV laser printer, a Megafile 30 hard drive and Timeworks Desktop Publisher software for under $4,000. ICD Technologies demonstrated the new Fast Tape Backup, a hardware accessory that archives data from a hard disk onto a specially designed audio tape. The unit moves data onto the tape at 6.5 megabytes per minute, about two minutes for an average 20-megabyte hard-disk drive. "The tapes are thicker and have higher-quality coating than regular audio tape", said Craig Thom, ICD Technical Support. The extra coating makes the tapes, which cost $34.99, run faster and withstand high temperatures. Up to 155 megabytes can be recorded on each tape. The backup unit has the same footprint as the Megafile 30. The unit plugs directly into an ST’s Hard Disk/DMA port. DMA Out allows the backup unit to be daisy-chained to other devices: hard disk, laser printers, etc. ICD also sells hard-disk-equipped units. A battery-powered clock is built into the controller board, and individual file recovery is possible using the GEM-based backup software. TOS, MS-DOS, Spectre 128 and Magic Sac partitions are also supported in image-backup mode. Also on the backup scene, Mirror Image ($27.95 List) is a new hard-disk backup from Computer Avenue. Developed by Ron Carter, Mirror Image makes a bit-image copy of a hard disk, storing the data onto a floppy. The program, written for beginners, estimates how many floppy diskettes will be needed before commencing the backup. Optional printed status reports are also available. Often it becomes annoying to keep reaching from the mouse to keyboard while working with a program. Fastkeys ($39.95 List) is an ingenious new product that brings the ST keyboard to the mouse. Fastkeys is a plastic strip that sticks to the side of a mouse. A flat plastic runner attaches to the mouse cable, eventually running into the ST’s cabinet. Under the ST keyboard, the runner terminates into a set of metal contacts that are attached to the switch contacts of several keys. When a button is pressed on the side of the mouse, the keyboard switch makes contact, fooling the ST into thinking that a key has been pressed. Since any keyboard switch may be contacted, Fastkeys can simulate any keyboard function. Fastkeys comes with several commonly used function button labels: Return, Delete, Backspace, Undo, Shift, Tab, etc. Several ST games use the calculator keypad to control the direction of a player, just like a joystick. Keestick ($6.95 List) is a new product that turns the calculator keypad into a joystick. Keestick places a small circular piece of rubber on the "5" key. A plastic wand attaches to the "5" key, pressing the "4," "8," "6" and "2" keys, depending on the direction of the wand. Although it might seem foolish to use Keestick, a noticeable difference can be felt when playing games that use the keyboard for movement. Finally, for those of us who just use a plain mouse, there are full-color high-tech mouse pads. Precision Line has jumped into the four-color mouse pad market with a series of designer mouse pads. Graphics range from Japanese illustrations to photos of fish swimming around a coral reef. The company also offers mouse pads that feature a clear plastic liftoff cover. These pads allow you to put your own artwork under your mouse. Datafree Industries, a Toronto-based Canadian firm, has introduced an upgrade board for ST computers that pushes the operating speed of the CPU to 16 Megahertz—twice the usual speed. The 16 Megahertz Upgrade kit costs $199.95 and replaces the 68000 chip of any ST machine. Installation requires technical experience with electronics, as the 68000 chip must be removed from the ST motherboard (not an easy process.) The kit makes most ST software run 30% faster overall. Additional speed improvements will be made when a software blitter becomes available from Datafree later this year. Atari old-timers have fond memories of Batteries Included (B.I. ), a Canadian software house that provided most Atari 800 owners with their first word processor, Paper Clip. B.I. was eventually bought out by an oil company, then sold to Electronic Arts, another software-publishing company. Inside its clam-shell-style enclosure, Portfolio sports a four-line, 40-character LCD display. The text is large enough for most users; however, the display is big enough for simple tasks, but not enough for most MS-DOS applications. Martin Herzog, B.I. 's former marketing director, appeared at the Atari booth to "see what was still happening in Atariland." Out of the ashes of the old B.I., most of the employees are now back together at Delrina. Mark Skapinker, former president of B.I., heads the new software-publishing company that specializes in MS-DOS applications. The Atari Scholastic Series brings the classroom to the ST. Available programs include: Biology, Chemistry, Physics and Algebra I and II. With 1 MB of RAM (expandable to 8MB) and a 60-MB hard drive, the PC 4, Atari's 286 AT-compatible, offers the expanded memory required for today's CAD, graphics and desktop publishing applications. TOS, the ST operating system, is being upgraded. TOS 1.4 fixes many major bugs, gives ST users a new GEM file selector, adds extra options to the GEM Desktop and operates faster overall. TOS 1.4 was officially announced at COMDEX. Mega ST computers were the first this year to receive the chips. Logical Design Works (LDW) demonstrated the enhanced version of what has become the most popular spreadsheet for the ST. LDW Power, Version 1.1, fixes several minor bugs, allows graphs to be saved in DEGAS Elite format and supports up to 32,000 points in a graph—the first version was limited to 100 points. Mark Williams Company demonstrated the new version of its popular C compiler: Mark Williams C, Version 3.0. At $179.93 list, MWC 3.0 comes with a new resource editor that creates icons, menus, dialog boxes, forms and alerts. A new source-level debugger has also been released at a $69.95 list price. The debugger allows programmers to view the actual source code as expressions are evaluated, functions are traced and variables are displayed. Williams has also begun shipping the Atari ST Library Source Code. By looking into the C Library, C programmers can learn the techniques used by Williams' professional programmers to develop programs. The Library Source Code has a list price of $149.95. Abacus Software introduced BeckerCAD ST ($295 List), a professional computer-aided design system that supports Post-Script output for finely detailed printed results. BeckerCAD's standard features include polygons with any number of sides, freehand drawing, automatic line measurement, definable grids, multiple line widths, trim, divide, zoom and undo operations. Abacus' demonstration of BeckerCAD shows a sophisticated piece of software that runs on any ST with a minimum of one megabyte of memory—although two megabytes are recommended for complex drawings. Abacus also introduced Computer Viruses ($2.95), a pocket booklet by Ralph Burger that covers the ins and outs of how viruses work and how to protect yourself from them. The booklet is available directly from Abacus. COMDEX isn't drawing in new Atari dealers, as was the original intent of the trade show. Rather, Atari is making good use of COMDEX to mark milestones of progress in providing a sophisticated and broad platform to the American computer-buying public. Media and industry spokespeople come to the Atari booth every six months to see what Atari is up to, and they are often surprised to see new hardware being developed. Atari tried to show its business image with flat black-metal panels highlighted with modern lamps casting a brilliant white light upwards to an Atari logo. The booth design was reminiscent of IBM's earlier trade shows, when the high-tech image was important. The purge of Atari employees is never-ending. Mike Katz, head of Atari's entertainment division, left the company in February amidst a series of negative public remarks both from Atari and Katz. Shiraz Shivji, Atari's lead electronics engineer, was fired by Leonard Tramiel, head of development, because of a strained working relationship. Cindy Clavern, who administered just about all developer programs and user group functions, left Atari in March without explanation. Atari has fewer than 50 marketing and sales people in its Sunnyvale headquarters, not nearly enough to be able to administer the promised marketing program announced by Sam Tramiel at COMDEX. COMDEX focuses Atari's problem: They have a difficult time getting the message to the public because of disorganization brought on by frequent employee turnover. An example in point is the question of the newly announced three-pronged product-specific dealer channel. "The three prongs are mass distribution," said Joe Mendolia, V.P. marketing, "That's really the Sears type of distribution. Next is the computer specialty dealer. Finally, there is the business computer center. That's a three-pronged approach." Mendolia describes specialty dealers as the bulk of current ST retail outlets, business computer centers handle the Mega ST and offer their own service and support for Atari equipment. "I, very frankly, have to see the press release to see how it's worded," replied Mike Dendo, V.P. sales, when asked about the three-pronged dealer channel. Andy Marken, the new Atari press relations representative, spelled out the three-pronged dealer channel as a push to rebuilding the existing dealer channel with more dealer-cooperative advertisements, beginning a series of end-user advertisements later this year and opening new markets to existing products. Three different answers describing a new approach to the American market could only be the result of a group of new employees not knowing what each other is doing. The group of people, individually, get high marks for appearing open, honest and competent. Atari's future in the American market rests squarely on the amount of time these key employees stay with the company. Frank Cohen has been developing Atari programs since his first commercial product, Clowns & Balloons. He later developed Regent Base, an SQL 4GL database, and is currently producing a series of videotapes teaching ST users how to make the most of their ST software. You may contact Frank directly on CompuServe (76004,1573) and GEnie (FRANK.COHEN), or by writing to P.O. Box 14628, Long Beach, CA 90803-1208.